There were six streets in Hoole when, in 1866 a Miss Jane Carer, of Lorne Street, Chester walked one hot Sunday afternoon through Charles Street and saw children playing there. She saw the need and her prayer was, “O Lord, if there is work for me to do in Hoole, show me a room.” She first hired a room and then a house, a grocery store on the corner of Faulkner and Charles Streets. Springing from this work came the Westminster Schools given by the first Duke of Westminster to provide Day Schools and a home for the Sunday School. The Sunday School grew into an Unsectarian Mission with morning and evening services. The work was most successful but met with a certain amount of opposition and the leaders of that day sought a new spiritual home. In 1894 the ground in Walker Street was bought. At the same time a Church of England mission hall at Edge Hill was advertised for sale. Mr. F. J. Buck and another went and bought the building although they had no funds to draw on, except the Bank of Faith. A local builder put in the foundations free of charge and arranged for the purchase of the seating. A widow, much interested in the work, lent the sum required under the pledge of being allowed to remain anonymous. It was gradually repaid. The Mission became known locally as the “Tin Chapel”. For some years the work went on as an Unsectarian Mission. In 1908 it was considered best to join one of the recognised denominations and the Queen Street Congregational Church accepted responsibility for the over sight and provided an Assistant Minister to work in the area. In the 1930’s came a building boom and the once separated village of Hoole became part of the suburban landscape of Chester. The boom came to a halt with the advent of World War Two. 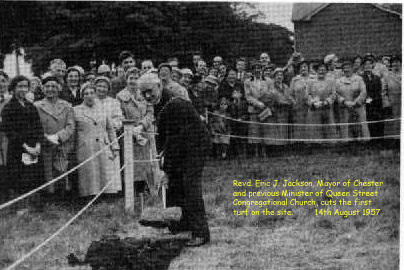 In 1945 the Deputy Mayor, who was then the Minister of Queen Street, Congregational church, the Rev. E.J. 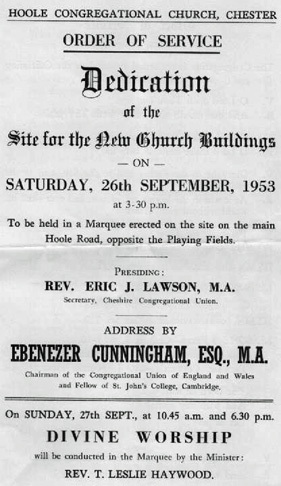 Lawson and Mr. Arthur Ward Jones, the Secretary at Walker Street, both men with foresight, who envisaged that building halted by the war was likely to extend dramatically beyond the old confines of Hoole, persuaded the Church to look for a sight for another building. Ideally the Church should be better located to meet the spiritual needs of a growing community. Eight years later a Manse was purchased at 75 Hoole Road and, for a short period, the Rev. Leslie Haywood became the Minister at Walker Street. Then a large area of land on Hoole Road unexpectedly, and at short notice, was advertised for sale by auction. Mr. Arthur Ward Jones, still the main driving force in the Church, called an emergency meeting of the Deacons and the decision to purchase some of the land as a site for a new church was taken. The land was not sold at auction but Mr. Ward Jones, with his business acumen, was not only able to negotiate its purchase but also by various dealings and being a constant inspiration to others was able to see the dedication of the Hoole Road site on 26th September 1953. 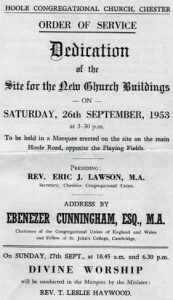 The service, conducted in a marquee, was presided over by the Secretary of the Cheshire Congregational Union. The next day, Divine worship was conducted in the marquee by the Minister, Rev. T. Leslie Haywood. Money raising efforts and plans to raise the necessary funds were immediately boosted by generous and sacrificial individual giving. In 1954 city council planning permission was granted and in May 1957 a tender of £10, 740 was accepted from Henry Jones and Sons of holt for a building designed by architect Kenneth Paterson. 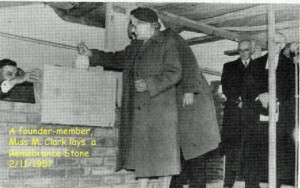 Three months later the builders took possession of the site and stone laying took place in November 1957 when offerings totalled £442. 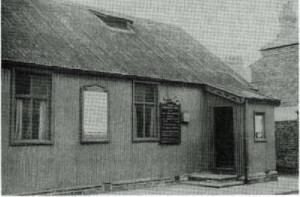 Complementary wooden halls were erected at the same time as the Church building. 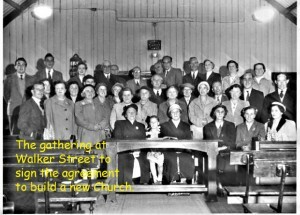 The Church opened on the 30th May 1958 with a membership of 55. Early in 1960 a new pipe organ, built by J.W. Walket and sons, and specially designed and voiced to suit the Church was installed. 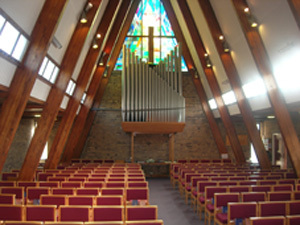 The organ console is detached and placed near the pulpit. The first part of the permanent halls was opened in September 1960. early in 1963 the manse in Hoole Road was sold for £1 700 and the present nearby manse, was purchased at a cost of £4 180. In May 1964 a tender of £7 500 was accepted to complete the permanent buildings of the Church. The façade of the Church is unusual and leaves no doubt in the mind of the passer-by that it is a place of worship. Its appearance has influenced some strangers to see inside it and subsequently make it their spiritual home. Closer inspection reveals much to symbolise the faith of the Church. 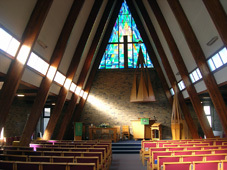 The centre of the large stained glass triangular windows at the front and rear is the Cross. The three diamonds framed in dark bricks on the wall behind the pulpit symbolise the Trinity. The door handles are in the shape of a fish – the secret sign of the early Christians. The timbers, of which the interior is constructed, come from many lands – symbolic that Christianity is world-wide. It has been stated that the Church building combines the height of Anglican architecture with the intimacy of the square meeting place and the setting of the whole in the best reformed tradition.